Ozzy's One-Ups 'Fit-for-Fun' project was an amazing success in 2017/18 filling the gap in leisure activities of choice for 36 disabled adults aged 19-30 years. The project supported people in the transition phase from youth club to more adult focused leisure and recreation services. The project is led by our cared for adults and supported by care staff. The project provided short-breaks from care for the 64 care providers of our 36 service users enabling them to participate in activities of choice. 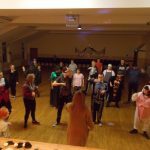 The project runs every Tuesday evening from our venue at Cathcart Old Parish Community Halls and encompasses other activities, outings and events organised and supported by our User Advisory Group. Alongside the excellent level of participation in sport and physical activities undertaken by the group we also noticed a real difference in their confidence, self-esteem and level of participation in new and challenging activities. A really successful aspect of this project was the joint work being delivered by the advisory group (carers and cared for). 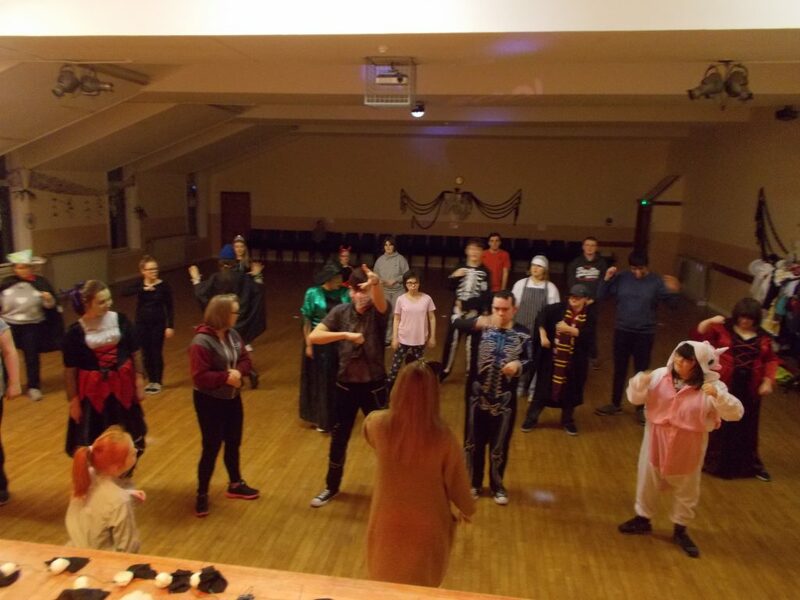 This group hosted regular discos for current and past members of the group and have supported the group to be involved in other outings. We are delighted to report that many of the group moved on to other leisure activities out with the Club via connections made through activities attended and supported by our Fit-for-Fun Project and we have been able to recruit new members onto the project from our waiting list. Initially the plan was to run the Club twice per week, but we were unsuccessful with funding from BUPA to match fund our Creative Breaks grant. To overcome this we engaged our advisory group support and in year one we have only been able to operate the club one regular session per week, but this is the reason that the advisory group stepped in and they now lead additional sessions via their ‘discos’ and the other outings. The project also enabled us to create an extended pathway and transitional period for all young people at club and importantly ensuring carers are supported at that very difficult transition phase from been a young person to adulthood recreational and leisure activities. Key to this project was the approach, moving to a self-led adult focused service. The Saturday Cafe Clubs Board and Staff had to learn alongside service users, how to create the environment to enable project users to take control of the service planning and service delivery. Many of the planned activities were changed and adapted as we moved through the months of the project. Flexibility is essential for this group - ability to try out new activities and express their preference of activities was a real balancing act for all users and staff. To support and overcome our adult group to participate in activities of choice we began to understand the importance of sessions promoting interdependence and team work. Making these interesting and exciting sessions has led to more empathy and compromise among the group. The Saturday Cafe Clubs Board of Trustees, Management Team and Staff are learning about new ways to deliver services for and with adults with disabilities and their care providers. We have had to reach out to our local community to look at partnership opportunities to help shape our service offerings to ensure there is as little cross-over of service opportunities as possible. The success of this project has gave us confidence to continue to develop services to support adults with disabilities in our communities and seek additional funding opportunities for this group. 30 adults with disabilities aged 19-30 years and 60 carers of the group will have participated in a range of activities to improve their physical and emotional wellbeing, attaining 3 personal activity participation goals. The outcome was achieved and exceeded with 36 adults and 64 carers being enabled and supported to participate in a range of activities to help improve their physical and emotional wellbeing. R is a cared for young man who finds it challenging to socialise in groups. R was excited about the activities on offer at the project, particularly sport and outdoor activities which motivated him to be a regular attender at the project. R reported that he now has a few good friends and attended a recent (supported) outing to a football match and is looking forward to continuing to attend the project throughout 2018/19. 60 carers of adults with disabilities aged 19-30 years will have a minimum of 3 hours (maximum of 6 hours) additional time free from their role of carer. The outcome was achieved with 64 carers being enabled and supported to participate in a range of activities to help improve their physical and emotional wellbeing. We would have liked to have been able to provide every carer with a maximum of 6 hours of free time, but due to lack of funding we were only able to meet our minimum of 3 hours free time with circa 62% of carers achieving the maximum 6 hours free time. R & M report the challenges of having 2 adults with additional needs in their family was somewhat lessened by the support of 'free-time' on Tuesday evenings. R explains that as their children have grown the challenges of getting some free time together was becoming more challenging. R is a working parent and M is a stay-at-home full time carer of their children. As an example of how they use their time M says that a few hours for a meal together or a relaxing swim or visit to the shops were all much more relaxed and enjoyable. 60 carers of adults with disabilities aged 19-30 years will have improved access to peer support and social activities to assist them to share achievements, discuss challenges and meet new friends/peers. We are delighted with the feedback from our evaluations on this outcome. All 64 carers have reported some improved access to additional social activities to share achievements, discuss challenges and meet new like minded people. Evaluations show that the extra-club activities have very much supported this outcome. 30 adults with disabilities have increased self-esteem and confidence to participate in leisure and recreational activities out with the project setting either in supported activities or self-led activities. A (male aged 20 years) has been at a member of our Clubs since the inception of The Saturday Cafe in 2001. It was a concern to A's carer that he was happy to transition through the service to the youth club, but when the day of his 19th birthday arrived A was not ready to transition to an adult service outwith Club. It was a huge relief to A's carer that an additional group for adults has funded that A could attend as this was A's only social activity which he would willingly participate in. At the One-Ups project we understood the importance of supporting A to transition to other leisure activities of choice outwith Club. To do this we have worked with A and a peer member to focus on activities both young men enjoy. Football was the activity of choice for this session. Since mid-project A has attended one supported football match with his peer and a carer (not primary carer), he has also attended an organised Disco with other members. A has some way to go, but his primary carer and A have reported a significant improvement in his willingness to 'try' a new activity.